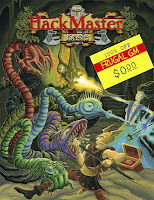 Now that the HackMaster Player's Handbook has been released, the folks over at Kenzer & Company have decided to make the HackMaster basic PDF available for FREE! This is HUGE! I cannot think of a better free GM resource than a whole fricken game! One of the criticisms that I've heard over the years is that HackMaster Basic isn't a "whole" game, which is complete and utter BS. This one pdf has everything you need to run a group up to 5th level. Everything for the players and the GM is in there. 5th level might not seem like much, but to put it in perspective, my highest level PC is 7th and I've been playing this game for the last three years. Granted it hasn't been all with one PC, but that has been a lot of gaming. Kenzer & Company have also put out everything needed to transition from levels 5 to 10 in Knights of the Dinner Table and in a few issues of HackJournal. Even if all you get out of it was a couple months of playtime.......that is a couple of months of FREE GAMING! I think you'll get a lot more that a couple of months, that is for certain. I tell you what, if you download the free copy of HackMaster Basic and don't get a couple of months of gameplay out of it, I'll personally refund your money! To top it off, the PDF comes with three free adventures and an excerpt from the Hacklopedia of Beasts.